Present honors the past, as Wayne Valley Wrestling Alumni gather for annual visit and current team rallies past a strong Wayne Hills squad, as Trani, Colella and Murphy star | Mike Lamberti, From Margate To Cleveland, And Back ! Forty five minutes before the start of the Wayne Hills at Wayne Valley wrestling match on Jan. 9, a large crowd had already assembled. 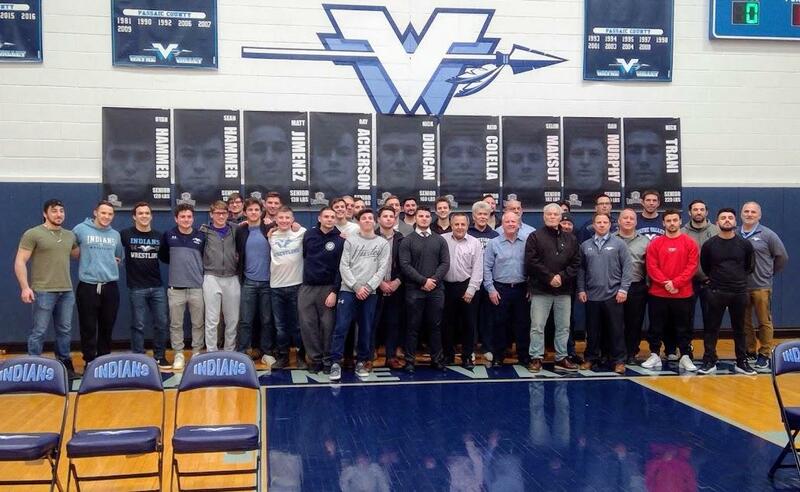 And while a Hills-Valley athletic event is always a popular draw, this was a special evening in that former Wayne Valley wrestlers had come together, to be honored by their school. It was the third annual Wayne Valley Wrestling Alumni Night, and Indian grapplers from as recent as 2018 to as far back as 1966 were on hand, receiving a nice ovation. The names included John Lucia, Wayne Valley’s lone state champion, who won his crown at 141 pounds back in 1966. There were others, too, in attendance, including long-time coaches Bob Bishop and Al Demarest, Dave Drozjock, a standout 148 pounder who is now the school’s athletic director, Todd Schroeder, a 2000 WVHS grad and one-time state medal winner, who, of course, is the team’s current head coach and many others, who will be noted shortly. Following the introductions, the current Indians took on their crosstown rivals, the Patriots, and came away with a hard-fought 36-21 win. Afterward, Schroeder was far from pleased, but quickly praised his opponent. Wayne Valley took a 5-3 record into a Jan. 11 match, at home, against Passaic Valley. A long road trip then began, on Jan. 12, with a quad at Ramsey. On Jan. 16, there was a 7 p.m. match at Lakeland and a day later, a bout at Fair Lawn, also at 7. On Jan. 19, a tough quad was slated at Randolph, which will include Morris Knolls and Whippany Park, and begins at 9 a.m. On Jan. 23, there’s a quick trip to Passaic Tech, for a 7 p.m. bout and on Jan. 26, the Passaic County Tournament will be held, at West Milford High, beginning at 10 a.m. The team’s next home match is on Jan. 30, opposite a powerful St. Joseph of Montvale squad, staring at 7 p.m. The Indians opened an early 5-0 lead when Sean Hammer won by technical fall at 132 pounds to start the match, but Wayne Hills’ Joseph Brunetti came back to win a 5-0 bout at 138 to cut the deficit to 5-3. Elijah Lugo gave Valley an 8-3 lead with a decision at 145 pounds before Hills gained its first lead, at 152 pounds, on a pin by Brian Peschel. The lead went back and forth, with Hills taking a 15-11 lead on an injury forfeit at 170 pounds. Valley then won the next six bouts on a major decision by Reid Colella at 182, an exciting 10-7 win by Dan Murphy at 195, a pin by Nick Trani at 220, a 1-0 victory from Jordan Botero at heavyweight, Michael Antonuccio’s pin at 106 and Andy Roth’s 3-2 victory at 113. Afterward, both Murphy and Trani noted that Wayne Hills wrestled a tough match. The Wayne Valley alumni on hand included Lucia, from the class of ’66, Bruce Wines and Bob Bishop, Sr., from the class of 1967, Jimmy Payne and Joseph Albanese (1974), Drozjock and Kevin McKiernan (1979), Nadal Hozien (1988), Randy Halat (1989), Eric Fauerbach (1990), Schroeder and Gary Didieo (2000), Kyle Hughes (2002), Carlo Fioranelli (2003), Enrico Fioranelli (2004), Bob Bishop Jr. (2007), Pat McHugh (2007), Mario Fioranelli and Mike Tepper (2008), Adam Baczynskyj (2013), Brandon Davis, Anthony Duncan, Vincent Rigoglioso, John Rohndi and Nick Milone (2014), Bassel Chaghlil and Ryan Lynch (2015), 2016 grads Resul Maksut, Louis Paduano and Dominic Rigoglioso, Nick Pellegrino, Thomas Astarita and Connor Murphy (2017) and last year’s graduates, Moe Baghal, Hunter Davis and Cole Drozjock. Dave Drozjock was very pleased with the turnout for the event. “Our third annual Wayne Valley Wrestling Alumni Night, which gathered over 40 former wrestlers and coaches, was another huge success,” said Drozjock. “We had former wrestlers from every year going as far back as 1966, and our wrestlers who just graduated from 2018, including Hunter Davis and my son Cole Drozjock.